London - 18th July - Brexit is in trouble, even the hardest of Brexiteers will admit. The idea that full trade access to the EU without conceding over immigration, the financial settlement (anything between £50bn to £100bn) as well as European Courts of Justice jurisdiction have been quietly pushed to one side. And nothing says Brexit is a bad idea more than the admission by Dominic Cummings, the former Vote Leave campaign director, that Brexit is a “dumb idea”. Cummings described the government’s approach in a series of tweets as “chaotic” and a “farce”. This was the man that had coined the phrase “take back control” and had devised the “£350m a week to the NHS slogan” for the Vote Leave battle bus. The charge is just getting under way, the Russian guns have yet to launch their first volleys and Cummings knows this isn’t going to end well. Boris Johnson, however, is at the front, rattling his sabre and reciting Tennyson (well… not really. It’s just an image… but this is Boris. Never say never). The hardest of Brexiteers believe this is what we have collectively voted for. But no one can comprehend what this will mean until it actually happens. However, current economic indicators do not look good. Industries that see EU membership as a key component of their trade are holding back. Earlier this month, the Society of Motor Manufacturers and Traders reported that investment in the UK car industry had plummeted to just £322m in the first half of 2017. In 2015 total investment for the year was at £2.5bn. Not so much a “Hussars” as a “Hurumph”. “It’s very difficult to cost investment if you don’t know what your output price is going to be,” says Mike Hawes, chief executive of the SMMT, adding that the industry needed more certainty, without which the car industry could fall off a “cliff edge”. The one man who seems to still be flying any kind of Brexit flag with genuine belief is Jacob Rees Mogg. 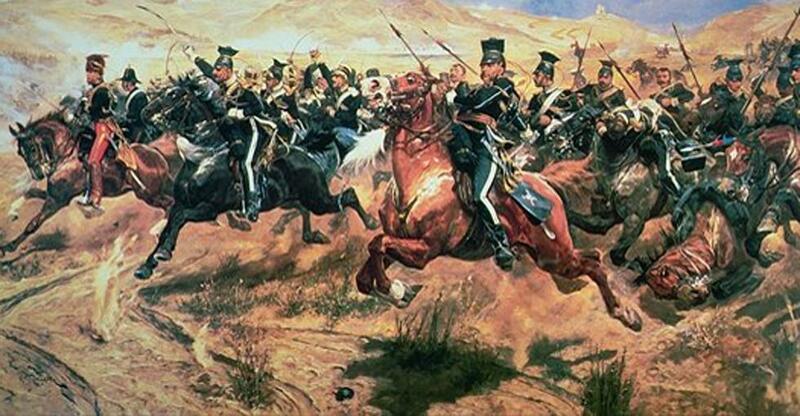 If May, Johnson, Fox and Davis and co, get blown apart by heavy cavalry during the concluding stages of their charge towards Brexit freedom, it might be Mogg who is left to carry the standard. A Twitter account @MoggMentum has sprung up with the description, “A grass roots movement to get Jacob Rees-Mogg into Number 10 – Time to get the youth back on side!” Before you raise an eyebrow, consider the position of your other eyebrow when Jeremy Corbyn confounded all. However, all this speculation about charges and economic turmoil may become academic if the government fails to get the Great Repeal Bill (which was published last week) passed through Parliament. Actually, it would be very typical of this government to call something “Great” like this only for it to land on its backside. The real name of the bill is the “European Union (Withdrawl Bill)”. However, it was Theresa May who (bathing in a pride that can only precede a downfall) at the 2016 Conservative Party conference decided to coin it as the “Great Repeal Bill” – yes, it has all the hallmarks of being a great, great disaster. The Bill aims to copy and paste EU law into British law. However, critics have pointed out that this is “a naked power grab”. Labour has stated it would oppose the bill unless six tests were met – including the retention of the EU’s charter of fundamental rights. With May’s spectacular “tear shedding” reduction in her majority at the last election the failure to pass this important bill could easily trigger another election – and with it a mandate on the future of Brexit. This article was contributed by FranchiseSales.com, the market-leading directory of franchise opportunities from online media group Dynamis.